Acland Street is a street in the Melbourne suburb of St Kilda, which enjoys great popularity as a recreational area, mainly due to its many restaurants and its proximity to the entertainment areas along St Kilda beach. 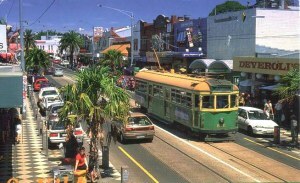 Acland Street runs on a north-west to south-east axis between Fitzroy and Barkly Streets. It was one of the first streets laid out when St Kilda was surveyed in 1842.